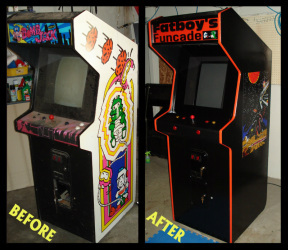 We are able to take old cabinets and transform them in a 60-1 Multicade for you. 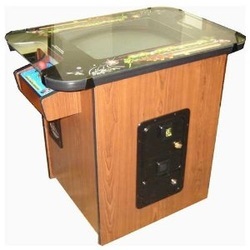 Features 19" flat panel screen, LED fire and start buttons, Pacman/Galaga joystick, ambidextrous play (where possible), side art, base black paint, custom color T-molding, custom marquee header, and LED strip lighting behind the marquee that runs cool and will probably never need replacing. Prices will very depending on requirements but typically run around $1000. We've got a nice cabinet to work with. We have a bad monitor and game inside though. We're thinking of turning it into our first cocktail multicade. If you would like a Galaxian cocktail though, this one is complete and we can get it up and running for you.